Though subversive, the environment in which art is exhibited has been used in contemporary art to display implications of contextualizing outside of the typical. The use of space is no longer neutral, it adds another dimension of what the exhibition wishes to communicate, whether it is being engaged with or not. Theorist Walter Benjamin in 1939 described ‘Cult value’ as the worth of art due to its inaccessibility to the public, only readily available to people in authority. The more valued pieces of art were the ones that only got revealed on special occasions, such medieval sculptures that are not visible on ground level. Then when art was being created in different ways, such as easel painting, art obtained a new type of value – ‘Exhibition value’, where works of art were being hung in public galleries. Art became even more accessible through the technology of photography, which Benjamin believes obliterated the authorities hold on art value. It now became that the more an artwork was exposed to the public, the more valued it was as art, for example, Leonardo Da Vinci’s Mona Lisa, which since 1913 has been reproduced in over 300 paintings and 2,000 advertisements. However, ‘Cult value’ in art still seems to exist, it has just been blanketed over by art galleries. For example, no matter how many times the Mona Lisa has been reproduced and exposed to the public, the Louvre museum in Paris, where the original is housed, recorded approximately 8,300,000 visitors in the year 2007. Even though internationally, art movements such as Conceptual Art and Street Art have highlighted the elitism implied in the white cube aesthetic, it still seems as a Caribbean people some generally feel uncomfortable engaging with contemporary art in an unconventional setting. They don’t like to think critically about art, but rather keep it at a level of aesthetic pleasure: if the colours go with your décor, then it is a good piece of art to own. Thinking about art as part of our culture, involves heavy interrogation of the creolization from colonization, something which Caribbean people like to ignore. The notion of ‘Cult Value’ is very much existent as well, it is not important how or why a piece of art is hanging in a gallery, if it is in there then it must be good art. It is undeniable that our contemporary culture still holds facets from our colonial past. The very nature of what art is seen in our galleries exemplifies this: glorified landscapes and faceless people are the main icons in identifying Caribbean Art. The picturesque and primitive are popular, and exhibiting them on clean white walls directs the viewer to visualize how the images would look on their own walls. Also in Barbados for example, there currently is no national institution to direct a sense of Art History on the island and insinuate taste, taste is completely controlled by commercial galleries which in turn are controlled by the source of profits: tourism. The white cubes here are not so much an elitist space for patronization and dictation as they are flattened shelves for displaying produce. As a result of the monotonous purge of imagery that comprises galleries, informally the present trend is for art networks in the Caribbean to convene outside of one type of space and into another. That is mainly to separate from the mainstream commercial galleries and establish non-conventional platforms as well as an expansive presence in the digital ‘space’. Art spaces like these are seen in Alice Yard (Trinidad), Fresh Milk (Barbados), Projects and Space (Barbados) Tembe studio (Suriname), as well as territorially abstract resources such as ARC Magazine (www.arcthemagazine.com), ARTZPUB (www.artzpub.com), Small Axe (www.smallaxe.com) and Caribbean Review of Books (www.caribbeanreviewofbooks.com) to name a few. These digital spaces represent the reality that the Caribbean itself is a diaspora, that is, not confined to where it is geographically but also how it has traveled culturally. On an international level, digital media and its impact on the arts has also had strong implications on the gallery / museum model, questioning it’s relevancy in an age of instant accessibility. So are they more suited to exhibiting artwork in a setting outside from the white cube aesthetic and is there enough critical thinking through the Caribbean for it to be significant where art is displayed? Or is it more of a ‘whatever is available’ type model? Arguably, despite perhaps superficially it seeming to be the latter, it is the former, even in its latency. Look at the plastic action movement in Cuba, where they literally took art out to the streets and presented it to the public. Or the Carnival costumes by Peter Minshall, which will never be as comfortably communicated displayed on museum mannequins as they are on revelers. 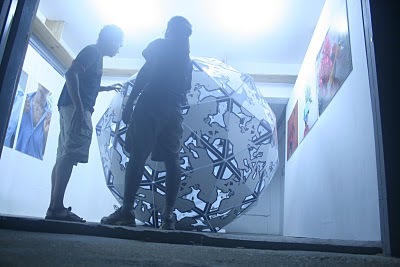 Ebony G. Patterson’s 9 of 219 (2011) would not have had the same impact exhibited down the halls of a gallery, the same for Charles Campbell’s sphere which he rolled through Port Of Spain in 2011. And not only that, how Caribbean artists engage with the white cube space displays the potential of critical thought. 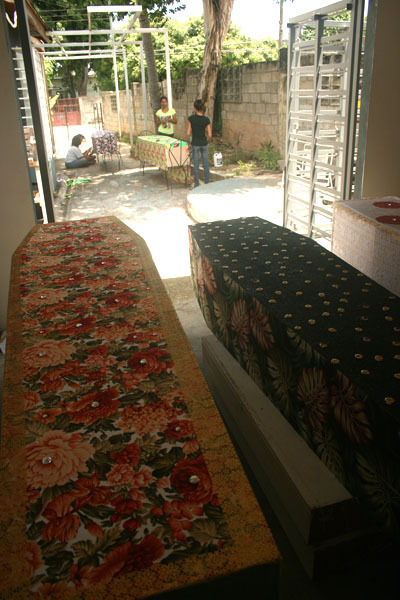 For example the recent exhibition by Sheena Rose in Barbados, ‘Town to Town’ (2011). 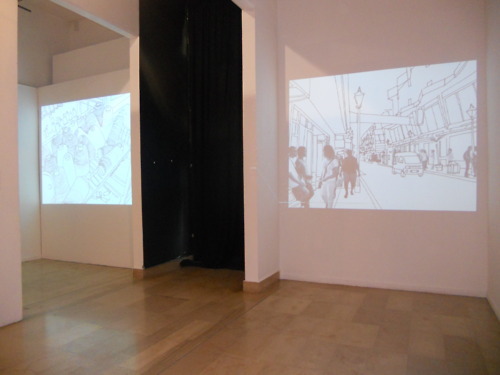 She presented two of her animation features simultaneously projected against parallel walls. The combination of the constant visual of being in a town with it being exhibited in a confined space created a pleasant juxtaposition, something which a thousand images of palm trees in a thousand galleries could never achieve. Another Barbadian Joscelyn Gardner achieved a similar effect during the Black Diaspora Symposium in 2009. Her piece words…just words…. comprised of extracts from M. NourbeSe Philip’s poem Zong! colliding with the 1657 text by Ligon The True and Exact History of the Island of Barbadoes projected onto the wall of the Public Library. This deconstructed the subjective nature of documenting history, and how that perception translates into a national sense of heritage. To conclude, there is a lot of room for exploration into Caribbean artists’ relationships with space when it comes to exhibiting work. It would seem the white cube aesthetic is still necessary to generate a perception of value on works exhibited, but at the same time the dialogue between the non-white cube spaces in the region is the significant driving force for the evolution of art reception.